Selecting which trades to enter and which ones to avoid is an important phase of the trading process. Traders of the financial markets know how difficult it is to strike the right balance in the number of setups entered. Luckily, some practical help is on the way. Today's article reviews a few of my recent trade setups and discusses why I entered a setup or skipped it. This article is a continuation of last week's blog post Insider Tips How to Select & Manage Trade Setups. 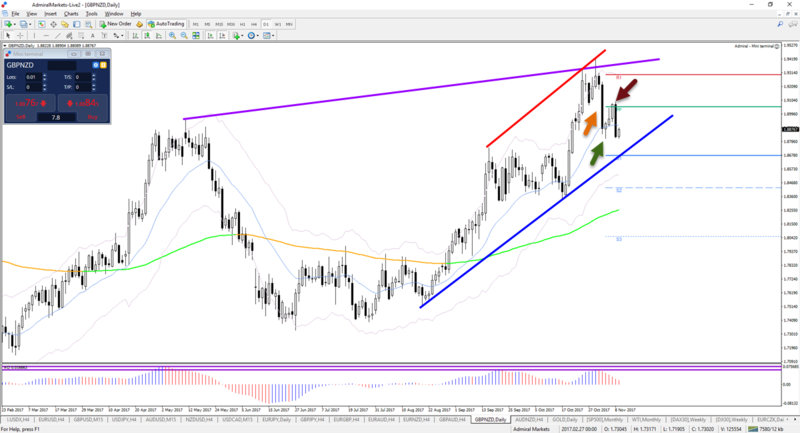 Next week, we will also offer a similar practical guide for managing trade setups. Let's first start with an introduction to my trading methods, so you can better understand why certain setups were entered or discarded. The next step is to identify within the market structure the decision zone and space I want to trade. My analysis will try to find a breakout or bounce at a S&R level that is expected to move a nice distance (for that time frame). Last but not least, I use candlesticks to confirm my entry after I have analysed the market structure and indicated a zone of interest. The video below explains how I use candle stick patterns. The GBP/AUD is a fine example of a classical trend, pullback, and continuation setup, which are my favourite trades. In this image, traders can clearly see a strong momentum both in the price and in the oscillator (blue arrow and blue box). Then, the price starts to build a corrective ABC pattern which bounces at a confluence of two Fibonacci support levels: the 50% Fib retracement level and -27.2% Fib target. Furthermore, the price is showing divergence between the bottoms. It's a classical momentum followed by a pullback scenario. An aggressive early entry could be at 50% Fib itself or a candlestick confirmation at 50% Fib. My personal trading style focusses more on candlestick confirmation and breakouts. In this particular setup, I waited for the breakout of the resistance trend line (orange) and entered a bounce trade at the end of the small bull flag pattern (red lines) on the 1-hour chart. Although I had a great entry and the bullish breakout continued higher as expected (green arrow), unfortunately, I only received 9 pips for the effort as I managed the set up too tightly (more on that in the next article). But the main point is clear: not much was standing in the way of a good bullish break. The green arrow shows how powerful such analysis can be. Another opportunity to go long on the GBP/NZD presented itself about one week later. 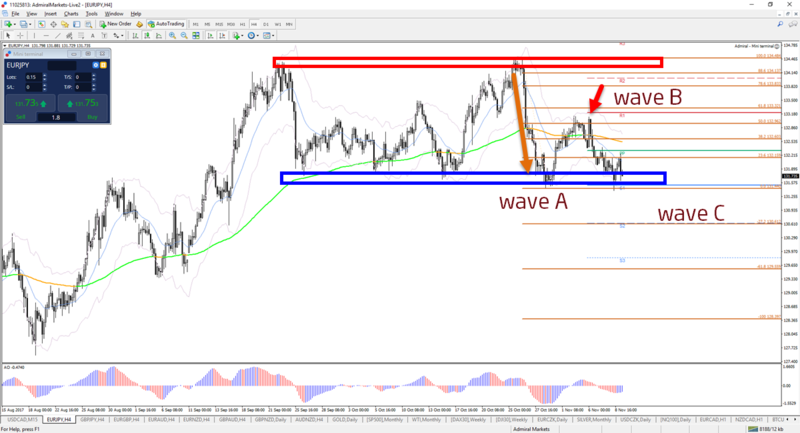 The price made a bearish retracement (orange arrow) within the overall uptrend (blue line). 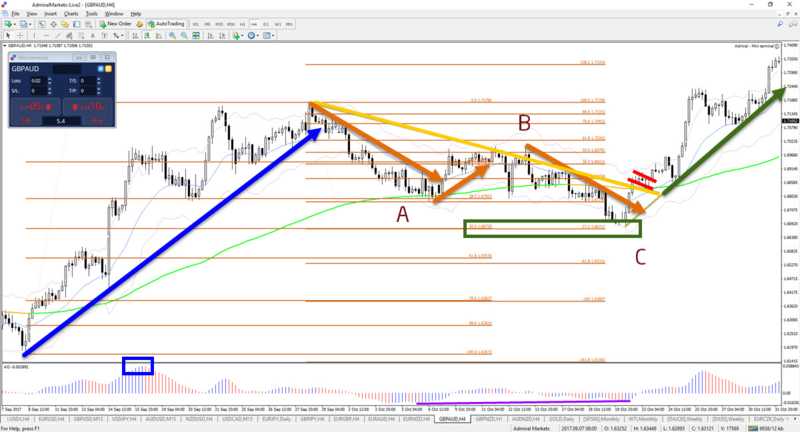 The main question was: would the approach I mentioned for trading the GBP/AUD in the first example work as well for the uptrend on the GBP/NZD 4h chart? The answer to that question was no, and the key factor in that decision was found on one time frame higher – the daily chart. On this time frame, I clearly saw divergence and strong bearish momentum candles (orange arrow). Although the first bullish bounce could still be a trade worth considering (green arrow), the next bullish breakout was from my perspective not a valid setup. The key tip was the presence of multiple divergences (purple lines) between the two tops (purple lines) and the two recent highs (red lines). The next bullish breakout (dark red arrow) at the weekly Pivot Point resistance was a setup I skipped. Later on, the price indeed made a strong bearish fall. In fact, reversal traders might have shorted this currency pair, but I chose to focus on other setups. I prefer trading with the trend, but in this particular case, there was double divergence between the tops on a daily chart. The price had also made a double top (red) and recently made a strong bearish momentum (orange arrow). From my point of view, it seemed like a potential ABC pattern. The price also respected the 50% Fibonacci level and then made a pullback to the same Fib for the 2nd time (red arrow). This is the spot where I entered the setup, and the price reached the first target for a +110 pip gain at the previous bottom (blue box). This setup was not as clear as the GBP/AUD or the GBP/NZD setup, which tends to happen regularly. The risk with this setup was that the price was in a range (blue/red box) and shorting a setup in the middle of a range is typically not the best. The advantages of the setup still outweighed the disadvantages, so I decided to keep the setup. Hopefully, this article gave you some insight into the ideas and processes behind the equation of filtering out potential setups. 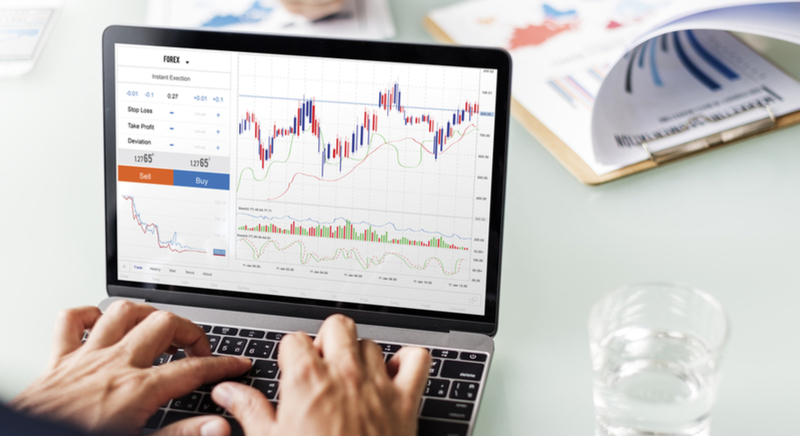 Make sure to check our education and analytics page for more useful tips as well as the Supreme Edition plugin for 60+ extra tools for MetaTrader 4 or MetaTrader 5.